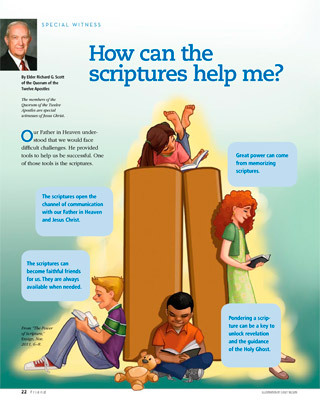 From “The Power of Scripture,” Liahona and Ensign, Nov. 2011, 6–8. Our Father in Heaven understood that we would face difficult challenges. He provided tools to help us be successful. One of those tools is the scriptures. The scriptures open the channel of communication with our Father in Heaven and Jesus Christ. The scriptures can become faithful friends for us. They are always available when needed. Great power can come from memorizing scriptures. Pondering a scripture can be a key to unlock revelation and the guidance of the Holy Ghost.